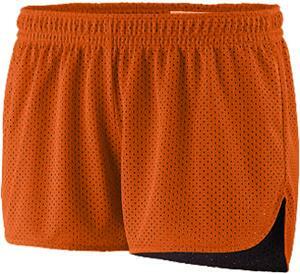 Augusta Sportswear Ladies Reversible Junior Fit Sassy Short. 100% Polyester tricot mesh outer layer. 100% polyester mini mesh inner layer. Junior Fit. Low rise. Covered elastic waistband. Fully reversible. Rounded V-notch at sides. 3 1/2-inch inseam. Waist (on half) 14" 14 1/2" 15 1/4" 16 1/8" 17 1/8"
Hip (on half) 20 1/2" 21 1/2" 23" 24 3/4" 26 3/4"
Inseam 3 1/2" 3 1/2" 3 1/2" 3 1/2" 3 1/2"